SeaWorld has felt the formidable backlash since Blackfish. SeaWorld's reputation, its profits, its future: all drowning, possibly irretrievably, in the midst of a long-awaited cultural shift toward compassion for cetacea. But they are problem solvers over there, you know? Two big announcements in the news today. This morning's rumored news is that struggling SeaWorld will be acquired by Comcast. Wait... Comcast? What does Comcast know about orca care? Well, nothing of course. But I'm supposed to trust oversight of marine mammal management to the company who can't keep my cable TV from going out daily? This buyout is purely a financial decision-and that's precisely the problem. The Comcast buyout underscores the obvious fact that SeaWorld has never been about the best interest of animals; it has always been about corporate enterprise. Once SeaWorld's finances began to crumble-and they have, with the company's shares falling 22% in the past year-a financial decision was made. But, what about the animal care? That's announcement two. 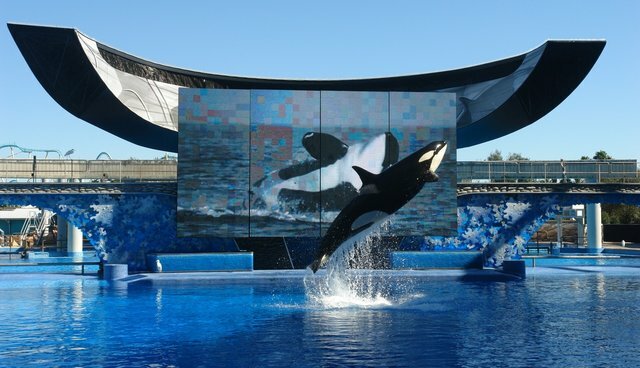 SeaWorld has issued a proud press release that it will pour tens of millions of dollars into a new, state-of-the-art killer whale "environment" (read: "tank"), the first of which to be built at SeaWorld San Diego. The "Blue World Project," which boasts providing "guests with the world's largest underwater viewing experience of killer whales" (it's still about the humans, first and foremost), is intended to enhance the educational experience for park-goers. (Conspicuously absent from the plan, though, is how this will improve the lives of the whales.) Excellent. A bigger concrete enclosure for an animal still meant for the ocean. It's similar to the zoos that pour tens of millions of dollars into bigger elephant exhibits when the answer-from the elephants' perspective-is not to be in a zoo in the first place. As SeaWorld's CEO, Jim Atchison, explains, "Our guests will be able to walk alongside the whales as if they were at the shore, watch them interact at the depths found in the ocean, or a bird's-eye view from above." "As if they were at the shore?" "At the depths found in the ocean?" SeaWorld (and now Comcast) can throw as much money into these programs as they want to, but it will never change the fact that these animals are still captive. This artificial environment pales in comparison to their natural range. And, of course, welfare of the animals is secondary, if considered at all. Any captive display of wildlife-whether it's at SeaWorld, a zoo, or a circus-is inherently focused on the experience of people, not animals. SeaWorld's desperate move with this Comcast buyout may be a major sign that the captive orca park will struggle to survive into the future. No amount of money or fancy new exhibit can change the fact that the SeaWorld brand is irreparably damaged. Operating under the fundamentally flawed premise of animal captivity, SeaWorld cannot escape the continued scrutiny of public and media. I can only hope that this is the beginning of the end for captive marine mammal "entertainment"-and it appears that many agree. Just ask SeaWorld's accountants.